Since August 2013 Final Fantasy XIV has been a fairly significant part of our lives. While we had a break in there, we have been in place for at least the last eight months soaking up every ounce of content that Square Enix can throw at us. Throughout this game the story of the game has been a constant topic of conversation among the aggrochat crew and friends. Each time a new tidbit of story was released it would start rampant speculation as to where the story might be going. As we made our way through the current patches content, I think it is safe to say that none of us could have guessed how this would have ended. As the credits rolled on the conclusion of the 2.0 storyline… the first reaction is that you absolutey have to talk to someone about it. This week we do a complete no holds barred spoiler filled romp through the Final Fantasy XIV storyline to date, talking about its conclusion and some of the elements from previous patches that might play into the future of the Heavensward expansion. If you have not reached the climax of this story arc, then I highly suggest you file this show away and return to it later. During most shows we try really hard not to directly spoil any content, and we will be returning to that next week. This week… we need to get this out of our systems, and if you have finished the storyline, chances are you do too. We talk about this a bit at the end of the show but yesterday they had a big live letter at like 3 in the morning my time, going over more details about the Heavensward expansion including some concrete details about the new jobs and how they would be starting. For some time they had said that they would not be starting at level 1, and that they did not have classes backing up the jobs. We speculated what that meant, and started to wonder if this would mean like other jobs they would start at level 30. Sure enough as per the slide above this has now been confirmed that new jobs will in fact start at 30, which means these new classes will be cutting their teeth on the likes of Brayflox. 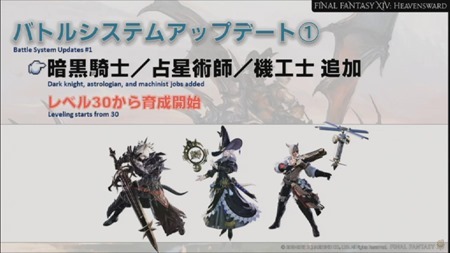 Another interesting tidbit is that apparently in order to experience these new jobs, or the new Heavensward content… you are going to have to have completed the main story through the conclusion in 2.55. This is quite honestly a shocking devotion to their storyline and one that I stand behind whole heartedly. One of the things that frustrated me about the Warlords of Draenor launch is the fact that it felt like they were essentially abolishing everything from the previous expansions from both a class standpoint by giving everyone a free level 90, and from a crafting standpoint in that you can level from 1 to max level through the garrison system. Sure this is going to create a barrier between new players and the content that players are now playing… but I have a feeling that Square Enix like always is going to find a way to make the old world content relevant. One of the slide bullet points that I have not been able to find much explanation about says something to the effect of “2.0 content adjustments”. So I hope this does in fact mean that we will have reasons to keep returning to older stuff. 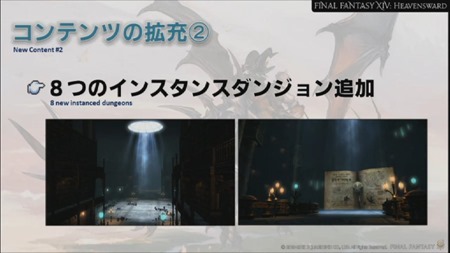 One of the slides that I saw that made me the happiest was that there are apparently eight new dungeons with the launch of the content. Now I have no clue how many of these will be “leveling” dungeons and how many will be “end game” dungeons. We also know that the expansion will be launching with the Alexander raid, and two primal encounters Ravana and Bismark. I know that over the course of 2.0 they introduced something like 18 new dungeons and I believe 16 trials. So I feel like eight dungeons is a pretty good place to be launching considering how much content gets added over time. Right now I am finding myself pretty torn in that I am not sure which direction I really want to take. I have waned to play a Dark Knight since the moment my friends first started trying to convince me to play Final Fantasy XIV. Now that I have it however… I am just thinking about much much fun I have running content as a warrior. I know without a doubt that I will have both at 60 and well geared, but I am not really certain which one I am going to push up first. So quite honestly right now… a lot of this is going to depend on how much enjoyment I get out of the Dark Knight once early release starts. I doubt we are going to get any sort of a test realm to play with them on. I wish that were the case because I feel like Dark Knight is eight going to be a class I immediately love, or a class that I can’t really stand to play. The whole spell tank thing can go in either direction, but if it ends up being more akin to the Shadowknight or the Deathknight… then I am all a bout it. If the end result feels very casterly… then I will most likely just stick to smashing things with my axe. Basically I feel like either this is going to be the class that I have always wanted to play… or the class that Tam has always wanted to play. However I feel like one of us is going to end up disappointed. Belghast, have you seen the Benchmark with the new jobs yet?